Natural Cognac Diamonds.20cts. Color: Cognac Clarity: SI2. Natural Blue Topaz: 10.50cts. Color: Blue Clarity: Clean. 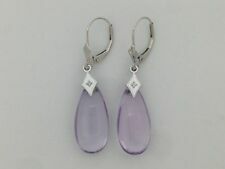 14K White Gold Fancy Cut Pear Shaped Quartz Earrings. Fancy Cut Clear Quartz Stones Have A Smooth Surface On Both Sides. Pear 10 X 15 mm. 14K White Gold. All gold jewelry is authentic and stamped 14K. Genuine green onyx gemstones are checkerboard cut and hand set into 14K white gold bezels. 14K white gold gemstone earrings with green onyx. Pear 10 X 15 mm. 14K White Gold. All gold jewelry is authentic and stamped 14K. Type: Natural Sky Blue Topaz. Shape: Pear Cut. Style: Dangle Drop Hook Earrings. Material Purity: Solid 14K White Gold. Size(mm) : 14 8mm. Product Marking: Au585 or 14K. Category: Gemstone Earrings. Earrings Setting. SOLID 14KT WHITE GOLD DANGLE EARRINGS. NATURAL DIAMOND IS 0.01 TCW. WITH GIFT BOX. 14K White Gold Fancy Cut Pear Shaped Black Onyx Dangling Earrings. Onyx gemstones are pear shaped and faceted. Pear 10 X 15 mm. 14K White Gold. All gold jewelry is authentic and stamped 14K. Stone Size. SOLID 14KT WHITE GOLD EARRINGS. NATURAL BLUE TOPAZ IS 13.70 X 9.20 MM. NATURAL BLUE TOPAZ IS CHECKERED CUT PEAR SHAPE. WITH GIFT BOX. Gemstones are set in 14K white gold bezels on 14K white gold leverback locks. Gorgeous chocolate colored smoky topaz stones are hand cut with a multi faceted finish for non stop sparkle. Pear 10 X 15 mm. • 14k Solid Gold Dangle Earrings with Natural Sapphire. 14k Solid Gold (Stamped). Oval 4x6mm:10Pieces:5.40CT. • Earrings Closure: French Clip. 100% Natural Stones. Be Aware of Must Be in Original Condition! Pear Shape 10 X 15 mm. 14K White Gold. All gold jewelry is authentic and stamped 14K. Artisan crafted earrings featuring safe and secure leverback locks. Stone Size Round 4 mm. 14K White Gold Earrings With Blue Topaz Gemstones. Pear Shape 10 X 15 mm. 14K White Gold. All gold jewelry is authentic and stamped 14K. Artisan crafted earrings featuring safe and secure leverback locks. Type: Natural Freshwater Pearl. Style: Stud Earrings. Material Purity: Solid 14K White Gold. Product Marking: Au585 or 14K. Category: Gemstone Earrings. Earrings Setting Side Diamond Center Stone. Natural Round Cut White Diamonds: 2.81cts. Natural Marquise Cut White Diamonds: 1.43cts. Natural Pear Cut White Diamonds.40cts. Color: Green Clarity: Has Inclusions. SILVER RINGS - SORRY BUT WE DO NOT SIZE SILVER RINGS. Gorgeous sunshine colored citrine stones are hand cut with a multi faceted finish for non stop sparkle. Pear 10 X 15 mm. Gemstones are set in 14K white gold bezels on 14K white gold leverback locks. Type: Natural Sky Blue Topaz. Style: Dangle Screw Stud Earrings. Shape: Pear Cut. Material Purity: Solid 14K White Gold. Product Marking: Au585 or 14K. Category: Gemstone Earrings. Earrings Setting Side Diamond . 14K White Gold Gemstone Earrings with Round Blue Topaz. 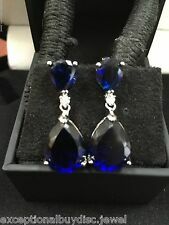 14K white gold dangle gemstone earrings with large fancy cut blue topaz with a total weight of 32 carats. Gemstones are hand set into luxurious corrugated wire bezels connected by 14k white gold jump rings to leverback locks. 14 k white gold Brioltte Brazilian Garnet &. 025 CTW length 27.4 mm width 10.5 mm primary stone 10 x 7 diamond color G-H clarity I1. Main Stone: Genuine Swiss Blue Topaz, Round Double Sided Checkerboard Cut, 12 mm, 16.00 carats, Lagoon Blue Hue with Brilliant Sparkle. Side Stones: 12 pieces 0.06 cts Genuine Diamond, Round Brilliant shape. Earrings: 2.05 grams, Pure 14 karat White Gold with 14k stamp, Earrings features exceptional Design, Craftsmanship and finishing. Perfect gift for Mothers Day, Birthdays, Valentines Day, Graduation, Christmas or just about any other occasion. Money Back Guarantee. Incldues a Signature Gift Box. Style E18434. Type: Natural Pearl & Ruby. Style: Lever Back Earrings. Material Purity: Solid 14K White Gold. Product Marking: Au585 or 14K. Earrings Setting Category: Gemstone Earrings. Side Diamond Shape: Round. If you like to make any changes to be made on a particular product of ours for ex. » If you have a particular design in mind, we can manufacture customised products as well. 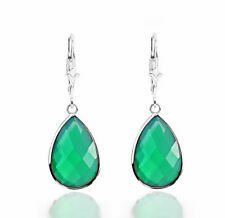 14k White Gold 15.00 carats Faceted Oval drop Green quartz bezel set dangle Earring. Pear 10 X 15 mm. 14K White Gold. All gold jewelry is authentic and stamped 14K. Artisan crafted earrings featuring safe and secure leverback locks. Handmade 14K white gold gemstone earrings with over sized large 20 X 15 mm oval hand cut blue topaz. Gemstone Earrings With Blue Topaz In 14K White Gold. Beautiful golden white color is enhanced by the white 14K white gold corrugated bezels. Style: Diamond & Topaz earring. Stone Type: Natural Topaz. Settings Gold Earrings. Gemstone Gold Earrings. Diamond Wedding Bands. Natural Diamonds Weight: 0.90ct. Settings Gold Ring. Gemstone Gold Ring. 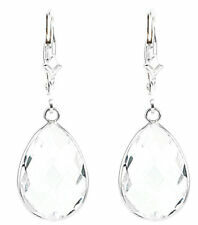 SOLID 14KT WHITE GOLD DANGLE EARRINGS. NATURAL DIAMOND IS 0.01 TCW. 2 diamond weight. 01 carat. Pear 20 X 15 mm. Gorgeous extra large Swiss blue topaz stones are hand cut with a multi faceted finish for non stop sparkle. Gemstones are set in 14K white gold bezels on new 14K white gold shell style leverback locks. Main Stone: Genuine Amethyst, Round Double Sided Checkerboard Cut, 12 mm, 11.75 carats, Royal Purple Hue with Brilliant Sparkle. Side Stones: 12 pieces 0.06 cts Genuine Diamond, Round Brilliant shape. Earrings: 2.05 grams, Pure 14 karat White Gold with 14k stamp, Earrings features exceptional Design, Craftsmanship and finishing. Perfect gift for Mothers Day, Birthdays, Valentines Day, Graduation, Christmas or just about any other occasion. Money Back Guarantee. Incldues a Signature Gift Box. Style E18436. Pear Shape 10 X 15 mm. 14K White Gold. All gold jewelry is authentic and stamped 14K. Artisan crafted earrings featuring safe and secure leverback locks. Round 4 mm. Style: Diamond & Topaz earring. Stone Type: Natural Topaz. Settings Gold Earrings. Gemstone Gold Earrings. Diamond Wedding Bands. Clarity: VS. CENTER STONE Cut: Round. 14K White Gold. All gold jewelry is authentic and stamped 14K. Artisan crafted earrings featuring safe and secure leverback locks. Stone Size Round 4 mm. Pear Shape 10 X 15 mm. Diamonds: Natural Diamonds. Gold Weight (grams): 4.78. Clarity: Very good. You will get response within 24 hours. we are very glad to help you. Service you wholeheartedly. You may also like. Bracelet Earrings Pendant Necklace Bangles. Diamond Wt. We're not happy unless you are! Crystal Weight 16.66 ct. our jewelry. 925 Sterling Silver Wt. Gross Weight 9.80 gm. Wishing you Best Buying.Experience.